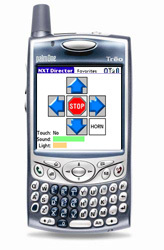 Use your Bluetooth enabled Palm device as a remote control for your Lego Mindstorms NXT Robot! NXT Director is Freeware for the Lego Mindstorms robot community, if you use it and like it please consider a donation. You can also support by purchasing our other product Call Director. v1.10 - *NEW* Updated button / motor assignments! v1.05 - Telemetry of Sound Sensor, Light Sensor and Touch Sensor added! v1.1 has new and improved button -> motor assignments which allow you to assign each button (forward, reverse, left, right) to any combination of motor A,B,C (forward/stop/reverse). This enables you to now setup NXT Director to work with a wider range of robot designs. Tested on Treo 650, LifeDrive, Zire72, SONY TH55/E and Tungsten series. If you have used it on other models let us know so we can add it to the list.